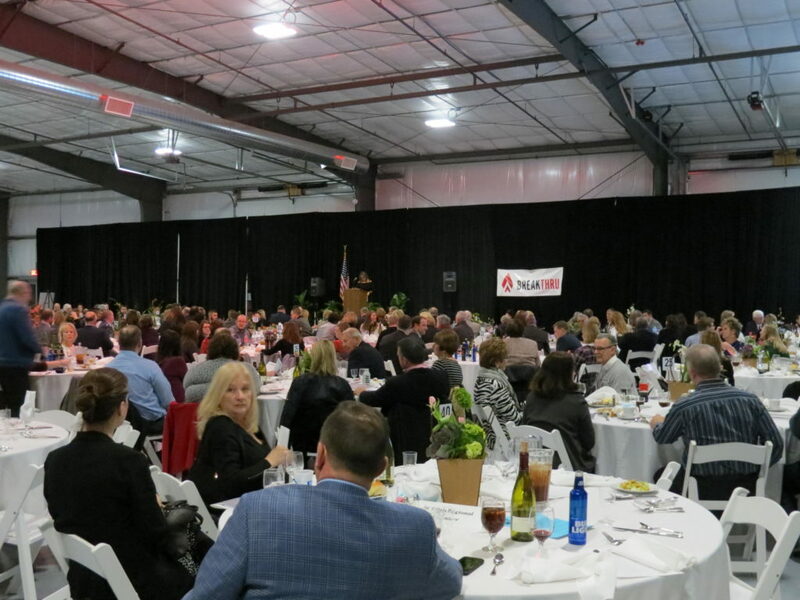 400 community members joined the Greater Belleville Chamber of Commerce Thursday night for their Annual Dinner and Silent Auction, presented by Breakthru Beverage, at the St. Clair County Event Center where the Chamber awarded five area leaders in the community. 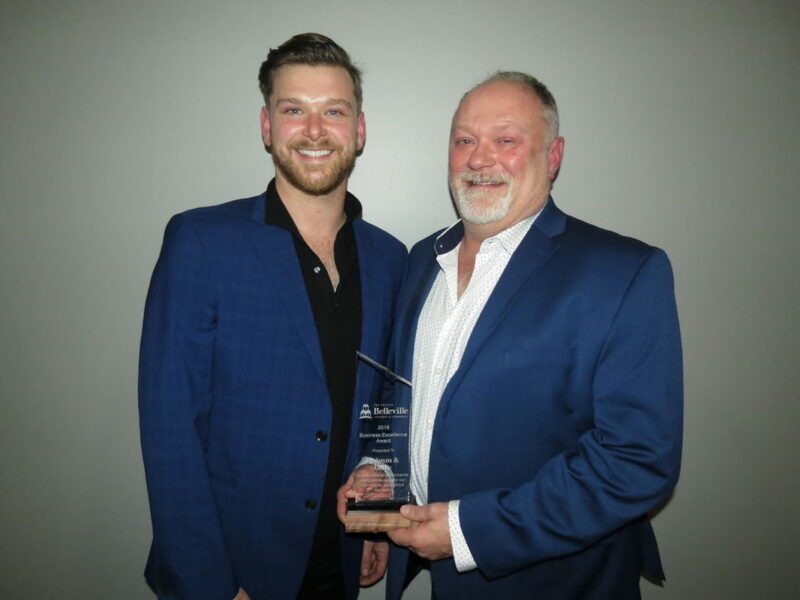 IMPACT Strategies and Grimm & Gorly Florist were awarded Business Excellence awards. Susan Wobbe (St. Clair County Office on Aging), Amy Richter (Hospice of Southern Illinois), and Kurt Schroeder (Greensfelder, Hemker & Gale, P.C.) were awarded individual awards. 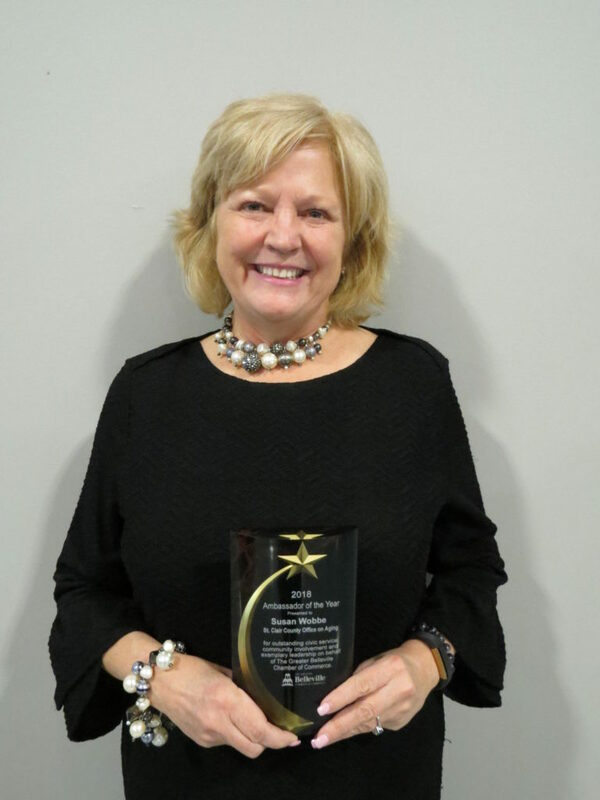 Susan Wobbe, recipient of the Ambassador of the Year award, served as Chair of the Greater Belleville Chamber of Commerce Ambassador Committee in 2018. She coordinated all the Ambassador luncheons and has volunteered for various Chamber events throughout the year including the Chili Cook-off. Wobbe has also been a seller for the Chamber’s Total Resource Campaign the past three years. 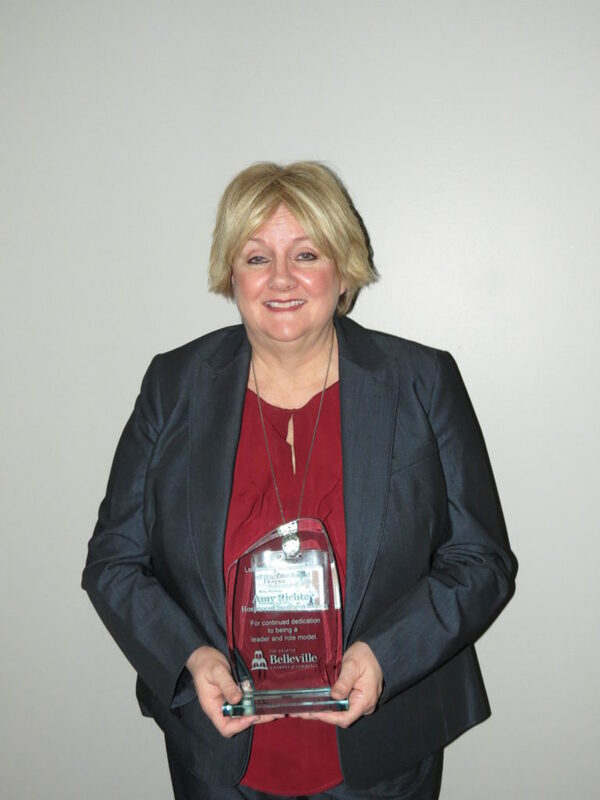 Amy Richter was honored the Leadership Belleville Alumni of the Year award and is a graduate of the Belleville Chamber’s 2011 Leadership Belleville Class. Amy continues to use the expertise she learned during the program, which includes the value of community, through her continued support of the Greater Belleville Chamber of Commerce. As President and CEO of Hospice of Southern Illinois, Richter has invested her company even more into the Belleville community with the recent purchase of their second building in Belleville. The original building sits at 305 South Illinois Street as their administration building. Their most recent purchase of 333 South Illinois Street will soon be the new home to for their clinical team. Richter is leading Hospice of Southern Illinois into 2019 as a continued proud community partner. 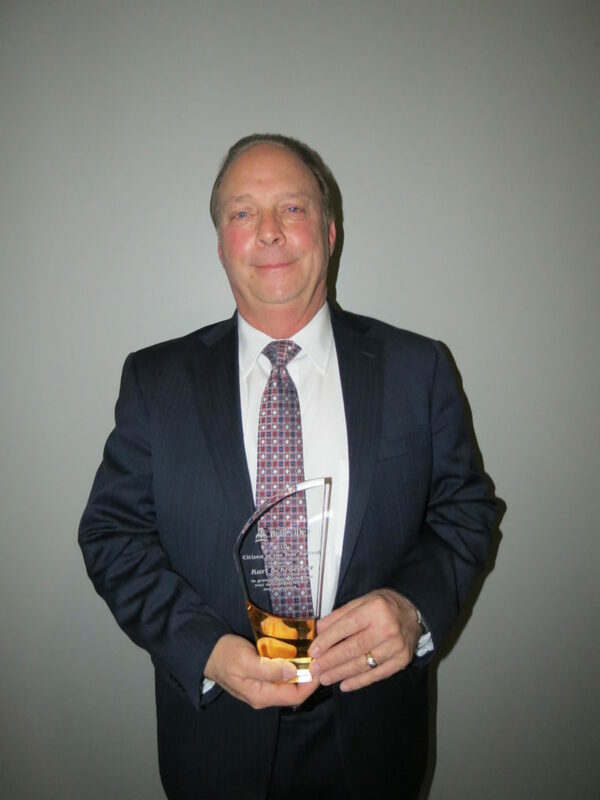 Kurt Schroeder was honored as the 2018 Citizen of the Year. With more than 30 years in real estate law, Schroeder’s experience representing national, regional, and local clients in complex legal matters has earned him the respect of peers and clients alike. His community involvement as a member of school and hospital boards in the region lends a deeper understanding of the legal issues those clients face. 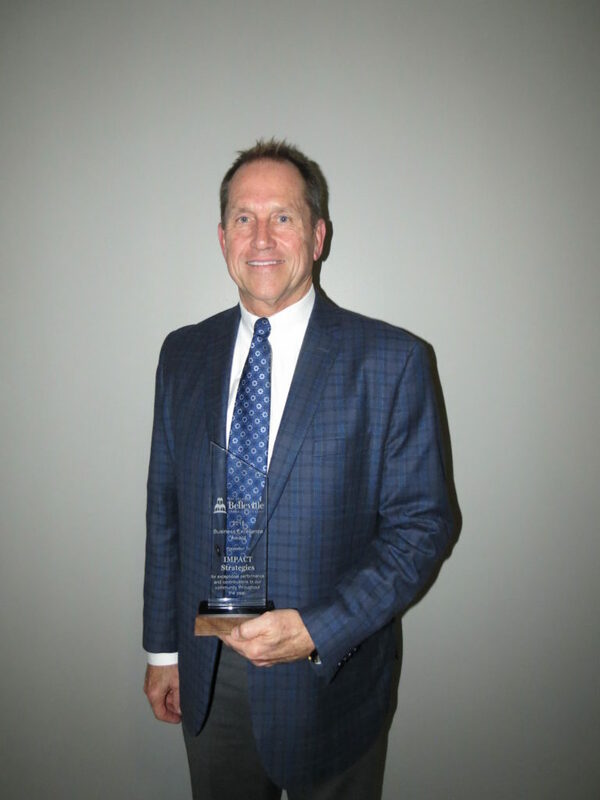 He has served on the boards for Memorial Group, Inc. and Memorial Hospital East, and continues to serve as co-chair of the Memorial Hospital Foundation Capital Campaign. He has also served as a Belleville Township High School District 201 Board Member since April 1999, and served as President of the Belleville Township High School District 201 Board of Education for 8 years. Schroeder has also served the community through other organizations such as the Greater St. Louis Area Council Boy Scouts of America, Okaw Valley Council Boy Scouts of America, and Rotary Club of Belleville. In addition, he holds affiliations with the American Bar Association, Illinois State Bar Associations and the St. Clair County Bar Association. In addition to the individual awards, IMPACT Strategies and Grimm & Gorly were presented Business Excellence Awards, the most prestigious award given by the Chamber to business members who best show evidence of success given a company’s expansion and financial accomplishments, development and/or utilization of innovative or creative business methods and contributions to community. IMPACT Strategies began their business in 2002 in the Greater Belleville area. Since then, they have grown to become one of the top construction companies in our area. This is evident by their professionalism, experience, and financial success. IMPACT Strategies is dedicated to the Belleville area. Throughout the years, they have contributed to the community through their work as well as various volunteer opportunities. IMPACT Strategies has a history of developing deep trust and confidence from their clients. They value Belleville’s resources and their impeccable character has truly made a difference in our community. Grimm & Gorly Florist & Gifts first opened their doors in St. Louis over 100 years ago. They later moved to East St. Louis, and finally settled in their current location at East Main and South Charles in Belleville during the 1950’s. In 2000, Jeff Bair became the new owner and embarked on continuing the tradition of florist excellence. His son, Zach, soon joined the team and together they lead an expansive business that includes the floral and gift shop, home decorating for the holidays, weekly floral and plant upkeep for commercial businesses, and now Pour322, a coffee shop and dessert business next to Grimm & Gorly. They also hold community workshops so others may learn in a hands-on setting. Grimm & Gorly/Pour322 is one of the unsung supporters of the Belleville community through what they do as a business but by also supporting many other area organizations. The Great Belleville Chamber of Commerce once again congratulates all of the award recipients this year. The Chamber is a membership organization that supports and advances business and community interests, as well as the quality of life in Belleville and surrounding communities. The Greater Belleville Chamber of Commerce is also ranked third largest chamber of commerce in the St. Louis area and the largest in the state of Illinois south of Springfield. For more information regarding the Greater Belleville Chamber of Commerce and to find a list of all of their members, please visit www.bellevillechamber.org. Jeff & Zach Bair with Grimm & Gorly Florist and Gifts awarded Business Excellence Award.